ArtΜsicaLSlides® Isabel - "China's breathtaking countryside"
Chan's camera tells her where to travel in China.Photographers make great guides for scenic trips -- they have a knack of finding places with stunning views but minus the crowds. This is especially helpful when traveling in China. 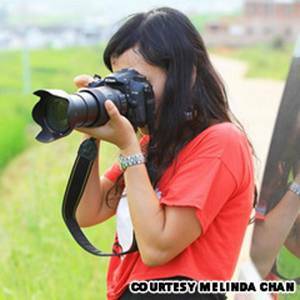 In the past decade or so, Macanese photographer Melinda Chan has traveled extensively in China with photo tour groups. She considers this a great way to see the real side of the nation. "Many photo tours are going to the places that are not very common for regular tourists," says Chan, who is an air traffic control officer at Macau International Airport. From her fat photo album, Chan picked out 11 favorite landscapes in China. The list below is arranged in no particular order. What's your favorite Chinese photo op? Let us know in the comments section below. More poetic than a water painting. Thousands of photographers descend on the 12-kilometer-long Xiaodong River every summer to capture the atmospheric fog. The surreal scene is created by differing water temperatures between the cold Xiaodong River, which flows from a dam 100 meters or so beneath sea level and eventually into the warmer Dadong River. 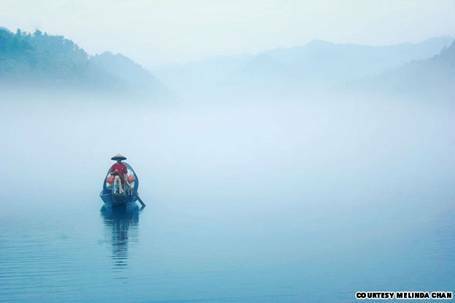 The fog creates poetic water painting-like photos, says Chan. She recommends photographers hire a local fisherman to row a boat along the river for better shots. The best time to observe the fog phenomenon is around dawn between May and October. The Xiaodong River is part of the 160-square-meter Dongjiang Lake scenic spot in Hunan Province in southeast China. Getting there: Dongjiang Lake is 28 kilometers northeast of Chengzhou city (郴州). Trains from Guangzhou (广州) bound for Changsha (长沙), Chengdu (成都), Shanghai (上海), Jinan (济南), Tianjin (天津) and other cities all pass Chenzhou. From Chenzhou, take a long-distance bus from South Bus Station to Dongjiang Lake. The journey takes about one hour and should cost less than RMB 20. 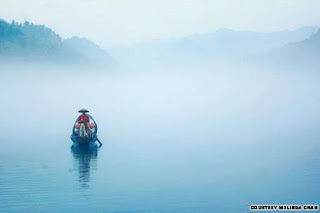 Admission to Dongjiang Lake costs RMB 52 (US$8). In deep inland China, some 2,500 kilometers northwest of the glizty skyscrapers in Shanghai, lies one of the nation's most spectacular natural phenomena. 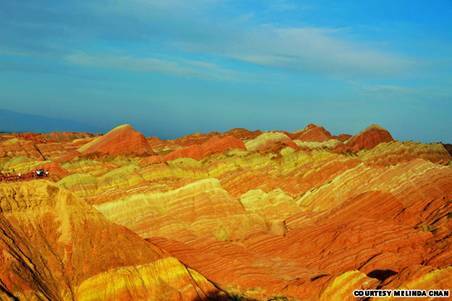 This landform, called danxia, was formed around 6 million years ago. At the Danxia Geological Park in Gansu Province, wavy sandstone features in an area roughly the size of Manhattan spread out in more shades than a box of crayons. Most areas are covered with red, yellow and orange stripes, but some hills are also tinted with green, magenta, black and even turquoise. Getting there: The park is located near Zhangye, a city about 500 kilometers northwest of Gansu's provincial capital Lanzhou. Trains leave regularly from Lanzhou to Zhangye. The journey takes five to eight hours depending on the train's speed. From Zhangye, take a bus from Zhangye Bus Station to Danxia Geological Park. Buses leave every 30 minutes from 7 a.m.-7 p.m. The journey takes one hour and costs RMB 9. Admission to the park is RMB 40. Autumn snow on former imperial hunting grounds. Some 460 kilometers northeast of China's capital, this meadow was a favorite hunting ground for the imperial family of the Qing dynasty. 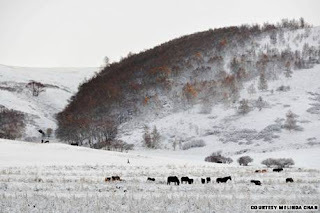 Occupying 940 square kilometers in south Inner Mongolia bordering Hebei Province, it's now the largest national forest park in northern China. Chan traveled there with friends in October 2010 to capture the golden scenery, but "we met with a sudden weather change." "Instead of a golden view, we got this amazingly beautiful snow shot," says Chan. The park has 800 square kilometers of grasslands accompanied by larch and birch forest that provide an ideal background for horse riding, archery and photography. Getting there: Take a long-distance bus bound for Saihanba (sometimes known as "Weichang") at Beijing Liuliqiao Bus Station. Buses leave every hour or so. The journey takes seven hours and costs RMB 104. Admission to Saihanba costs RMB 130. 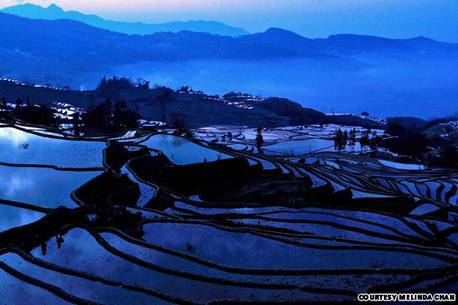 These rolling, mirror-like rice terraces can be found in China's southwest Yunnan Province. Mountain-dwelling Hani minorities converted the steep slopes into rows upon rows of rice stairs, stretching as far as the eyes can see. In Yuanyang, rice terraces run continuously for 113 square kilometers with a maximum vertical span of 1,500 meters, accommodating about 3,000 rows. According to Chan, dusk and dawn are the best times to photograph the view, when the water-filled terraces have the most shades of color. Getting there: Yuanyang County is about 320 kilometers south of Kunming, the provincial capital of Yunnan. Two buses bound for Yuanyang depart from Kunming's Nanyao Bus Station every day, one at 10:20 a.m. and the other at 8 p.m. The journey takes about seven hours and costs RMB 90. Religion and scenery meet in one little town. The remote but holy town of Langmusi (population 3,000) is a great getaway for culture-loving backpackers. Standing on the border of Gansu and Sichuan provinces, the plateau town is surrounded by alpine forest and lush mountains and is populated by Tibetans and Huis, a Muslim ethnic group in China. The town's landmark is its namesake Tibetan Buddhist temple. First built in 1748, Langmusi's temple has for centuries been a sacred site for Tibetans from south Gansu, north Sichuan and West Qinghai. Chan witnessed a Tibetan ceremony during her journey to Langmusi in July 2011. "They paraded with instruments, and it was interesting to see the monks with traditional costumes," says Chan. "It was like a scene from a movie." Getting there: Langmusi is some 400 kilometers southwest of Lanzhou (兰州), provincial capital of Gansu. Take a long-distance bus from Lanzhou's South Bus Station to Hezuo (合作). The journey from Lanzhou to Hezuo takes about four hours and costs around RMB 60. Nothing escapes Kanas Lake's reflection. 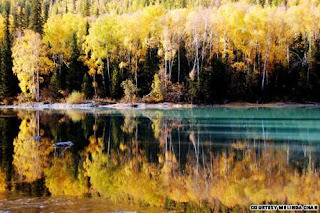 Located in the deep forest of Altai Mountain, this lake is best known for its extremely clear water, which changes color throughout the year as its reflection mirrors the surrounding environment. Early autumn is the season to go because golden leaves along the bank create "fairy tale-like scenery," according to Chan. She recommends going in late September and walking along Moon Bay. "The river is so clear and it has a lot of golden reflection," says Chan. Standing 1,374 meters above sea level, the 45-square-kilometer lake is in north Xinjiang, near China's border with Kazakhstan, Russia and Mongolia, and is home to the Tuvas, a group of ancient nomads in central Asia. Getting there: China Southern operates four flights from Urumqi (乌鲁木齐), Xinjiang's provincial capital, to Kanas. The flight takes about one hour. Admission to Kanas Lake costs RMB 150. 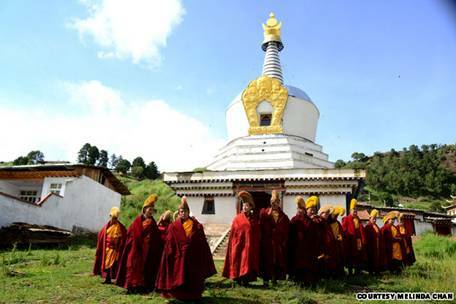 Holy land for Tibetan Buddhists. Thousands of red wooden dormitories in the lush mountains of rural northeast Sichuan form one of the world's largest Buddhist monasteries, Larung Gar Buddhist Institute. Sprawling across approximately four square kilometers at 4,000 meters above sea level, the "Buddhist metropolis" houses more than 10,000 disciples, who practice Nyingma, a major school of Tibetan Buddhism. Most wear traditional red gowns. Located in the Tibetan-inhabited part of Sichuan, the secluded Buddhist campus can be reached only after hours of bumpy riding on mountain roads. Nevertheless, Chan considers it her hands-down favorite destination in mainland China. Getting there: Seda County is about 600 kilometers northwest of Chengdu, provincial capital of Sichuan. The Chengdu Chadianzi Bus Station (成都茶店子客运站) has one bus bound for Seda every day at 8 a.m. The journey costs RMB 144 and takes approximately 14 hours. Larung Gar Buddhist Institute is about 20 kilometers outside Seda town. International travelers to Seda do not need a Tibet Alien travel/PSB permit, but regulations often change regarding permits to enter this region. It's advisable to consult a China state-owned travel agency before planning a trip. Canal charm in eastern China. One of the most iconic water towns in the country, Zhouzhuang provides a window to eastern China before highways, cars and skyscrapers took over the Yangtze River Delta region. Canals lace the millennium-old town, marked by late Ming Dynasty architecture and batik-clothed gondoliers (most of whom are middle-aged women). Don't expect this view in daytime -- the 2.7-square-kilometer town gets swamped by 25,000 tourists on an average day. If you stay the night, you'll be able to experience the peaceful side of the town in early morning and after sunset. Getting there: Zhouzhuang is some 80 kilometers west of Shanghai. 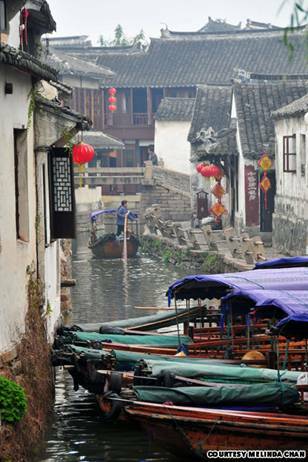 Shanghai Tourism Distribution Center organizes day trips to Zhouzhuang and other nearby water towns every day. Bus journeys to Zhouzhuang take 90 minutes each way and cost RMB 130 per person. 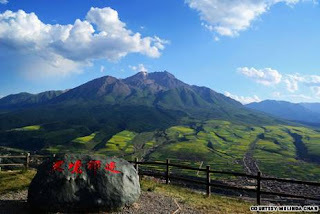 Admission to the mountains costs RMB 100. The hottest place in China. Near the Taklamakan Desert and stretching about 100 kilometers, the sandstone Flaming Mountains are the hottest place in China in summer. Average temperatures in July and August boil to at least 40 C with the ground temperature reaching nearly 80 C -- it takes about 20 minutes to fry an egg on the ground. Fissures on barren rocks can make the mountains look like solid flames. The living hell, however, is one of Xinjiang's most popular tourist spots due to its connection with the Monkey King. In the classic novel, "Journey to the West," China's very own superhero is said to have put out an immense fire with a palm-leaf fan. Getting there: The Flaming Mountains are 30 kilometers east of Turpan city, which can be reached by long-distance bus from Urumqi's South Bus Station. The journey takes around two hours and costs less than RMB 30. 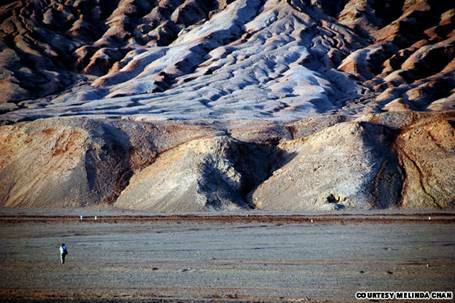 From Turpan, either hire a private taxi or join a day trip to the Flaming Mountains. There is little public transport available between Turpan and the mountains. Admission to the mountains costs RMB 60. An oil painting by Mother Nature with rapeseed and wheat farms. Chinese call this view "heaven's environment" (天境). "God's country," if you will. The country's best landscapes seem to assemble in this multi-ethnic plateau county: snow-capped mountains, sweeping grasslands and thick forests. Approximately 3,500 meters above sea level, Qilian is one of the most ecologically diverse regions in China. Rapeseed and wheat farms alternate in the fields, creating a bright oil-painting-like pattern when viewed from the highlands. Located at the foot of Qilian Mountains and on the former Silk Road, the area is home to ethnic minorities, including Tibetan, Mongolian and Hui. Getting there: Qilian County is about 280 kilometers northwest of Xining, provincial capital of Qinghai. The Xining Bus Station despatches buses bound for Qilian every day until noon. The journey takes about six hours and costs around RMB 55. Stone spectacle above the Yellow River. These awe-inspiring rock pillars can be found along the banks of the Yellow River in northwest China. They form a 50-square-meter geological park. Formed approximately 210 million years ago, the columns originally stood as high as 200 meters. Most pillars are 80-100 meters high nowadays. Chan says the stone forest park is one of the least-visited tourist destinations in China, making it ideal for travelers who like exploring China off the beaten path. She recommends touring the rock posts via donkey cart, the preferred local mode of transportation. 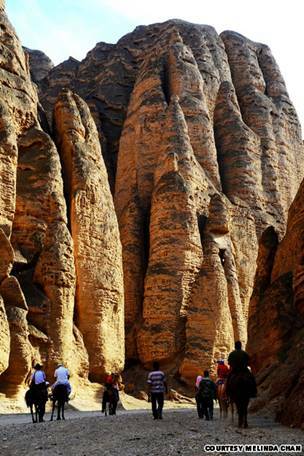 Getting there: Yellow River Stone Forest Geological Park is located in Jingtai Town, about 100 kilometers northeast of Lanzhou, provincial capital of Gansu. Public buses are available between Lanzhou Zhongchuan Airport and Jingtai Town, then to Jingtai and the rock pillar scenic zone. Admission to the park costs RMB 110. ArtΜsicaLSlides® Isabel - "Shanxi in China"
ArtΜsicaLSlides® Gé - "ALIMENTO 03.11.12 - 09.11.12"
"Tendo os olhos fixos em Jesus, autor e consumado da nossa fé. Ele, pela alegria que lhe fora proposta, suportou a cruz." 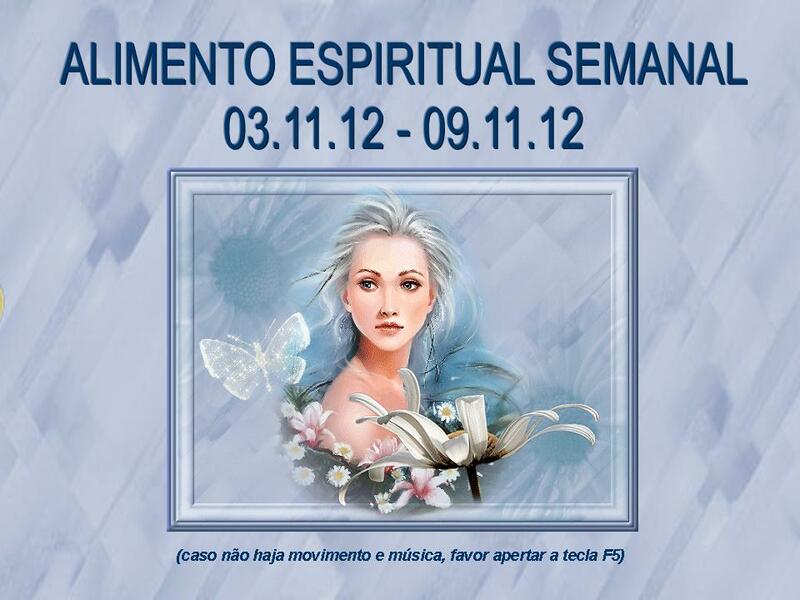 Lembre-se, o céu não era algo estranho a Jesus. Ele é a única pessoa que viveu na terra depois de ter vivido no céu. Ele conheceu o céu antes de vir à terra. Ele sabia o que o aguardava em Seu retorno, e saber o que Lhe aguardava no céu O capacitou a enfrentar a vergonha na terra. "Eu os escolhi para irem e darem fruto, fruto que permaneça." Um bom jardineiro fará o que for preciso para ajudar uma vinha a dar frutos. 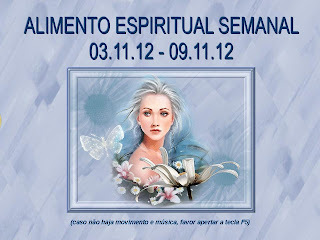 Amor, alegria, paz, paciência, amabilidade, bondade, fé, gentileza e auto-controle (Gálatas 5:22-23). Esses são os frutos do Espírito e é isso o que Deus quer ver em nós. E, como um Jardineiro cuidadoso, Ele irá podar e cortar qualquer coisa que interfira. "Sua satisfação está a lei do SENHOR, e nessa lei medita dia e noite." Bíblia não é um jornal para ser folheado, mas uma mina a ser explorada. Aqui está uma questão prática. Estude a Bíblia um pouco de cada vez. Deus parece mandar Mensagens como Ele fez com o maná: um pouco a cada dia. Escolha profundidade em vez de quantidade.